The second direct skywalk has been inaugurated in Kochi, enabling Metro commuters at M G Road to directly reach The Chennai Silks. KOCHI: The second direct skywalk has been inaugurated in Kochi, enabling Metro commuters at M G Road to directly reach The Chennai Silks. The Metro link bridge was inaugurated on Sunday as part of celebrating the 10th anniversary of the textile shop. 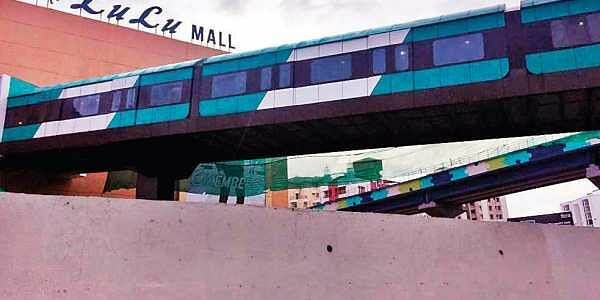 In accordance with the Kochi Metro Rail Ltd (KMRL) station interconnection policy, it is the second direct metro link that has been opened, Lulu Mall being the first. This is a major milestone in the history of the 56-year-old Chennai Silks, the Metro station and bridge will make it more convenient for shoppers. On their 10th anniversary, they have announced an attractive discount on all purchases. “The Chennai Silks is proud to open the second direct Metro bridge, the first to a premium textile store. One can notice each Metro station is planned on different themes. The theme for MG Road station is the perfect place to add The Chennai Silks Link Bridge,” said the MD of The Chennai Silks.